In a much-discussed new book, Once in a Great City: A Detroit Story, author David Maraniss writes of a little-known plan in the early 1960s for Detroit's Big 3 to build small cars together. At least it was the plan of Walter Reuther, the legendary UAW president. Reuther came up with the idea for a joint venture involving the three automakers that would compete with Volkswagen -- then the small-car powerhouse in the U.S. -- and Japanese carmakers that were just expanding sales around the world. The union leader worried that foreign companies would dominate the global small-car market, resulting in job losses for UAW members. What's more, he was alarmed by the closure of Studebaker's small-car assembly plant in South Bend, Ind., a few days before Christmas in 1963. Indeed, it was a turning point in the history of the industry. Maraniss notes that 1963 was the first year in which more than half of the cars in the world were built outside the U.S.
Reuther had been trying since 1949 to get the Detroit automakers to build small cars, Maraniss writes. "Now he and his aides at the UAW developed a grand scheme to create what he called an 'all-American small car.' It would require central planning and cooperation between labor and industry and the automakers themselves." The idea was to produce the car in the idle Studebaker plant. Maraniss: "Reuther dug out a quote from Henry Ford II to explain why a joint venture was needed. 'Volkswagen sold about two hundred thousand cars last year in this country,' Ford had said. 'But if we started to compete with it, then General Motors would go in, and probably Chrysler, and by the time we start divvying up what is left in a market of this size, there's nothing there.' A joint venture would overcome that problem, Reuther argued." The UAW leader also figured the Detroit 3 could cut costs by avoiding annual model changes, as VW had done with the popular Beetle. 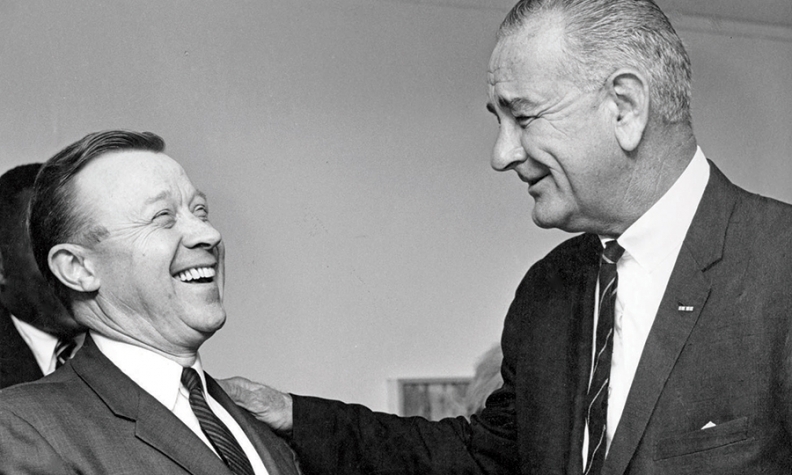 The most intriguing part of the story was the strong support Reuther got from President Lyndon Johnson, who wanted to keep the powerful union leader as an ally. Meanwhile, Johnson's secretary of defense, former Ford President Robert McNamara, argued to LBJ that the idea was impractical. Maraniss: "McNamara was nonplussed. What was his boss thinking? Aside from all the ways this idea ran counter to the automakers' free enterprise philosophy, it also seemed naive, blind to the realities of Detroit. The Big Three would reject the idea outright, McNamara advised, speaking from his experience at Ford, precisely 'because it was Reuther who wanted it.'" LBJ was not dissuaded and continued to push the idea, even suggesting the Defense Department could "do a little contract" to help the small-car project along. According to Maraniss, Johnson told McNamara: "You're the biggest users. Why don't you give 'em a contract, instead of running around in these damn big old waterboats you gotta have? Why couldn't you buy a hundred thousand?" McNamara was aware that Johnson himself liked to ride around in "waterboats." Maraniss writes: "Small cars were just not right for the Pentagon, McNamara said. The brass needed more room, more comfort. To which Johnson replied, '[Well, what about] all those sergeants whirling around in Mercurys, delivering messages for generals?'" Alas, the author writes: "Reuther kept pushing his all-American car idea, but it never got anywhere beyond the calculating mind of the president."